Welcome to the World of Hanger Appeal! Welcome to my fashion blog Hanger-Appeal: Fashion from the Far West! Let me introduce myself. 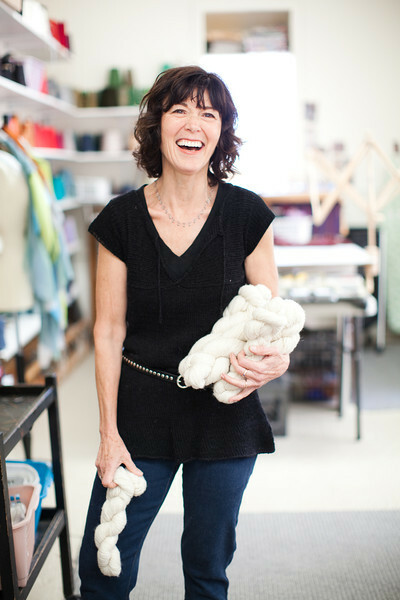 My name is Susan Hayes and I am the proprietor of the clothing store, Susan Hayes Handwovens, a retail store in Point Reyes Station, CA, which features local and American made artisan clothing. Needless to say, I am frequently answering all aspects of questions about clothing. Being one of our most basic needs, it’s hardly ever addressed in a real way. Sure we all read Vogue – but how much does that have to do with getting dressed for work in the morning, or throwing something on to go to the grocery store? Dressing should be as easy as whipping up a stir fry. Yet, it often perplexes the majority of us. Trends are fun…but aren’t we all really looking for solutions that give us a personal style that makes us feel good when we walk out the door? There will be many facets to this blog. First, there will be a Do-It-Yourself element where you, the reader, will gain hands-on advice on how to create your ideal wardrobe. Subjects we will be discussing are closet maintenance – purging and organizing. How to create a list of your clothing needs, then, how to prioritize these needs and strategize in order to successfully complete them. Additionally, we will also be discussing how to take care of your clothing to receive the greatest return on your investment. Secondly, among customers, I see a great curiosity as to how, where and under what conditions clothing is made. At Susan Hayes Handwovens, we do our best to buy American made clothing and to vet companies. I’ll be regularly profiling our designers here and discussing what we currently have in the store, as well as how it can work for you. So, why listen to me? Besides owning a clothing store, I have been sewing and making clothes since childhood. My education is in fine arts and I have worked in the apparel business my entire adult life, producing handwoven clothing and accessories. With Hanger Appeal, I hope to create a dialogue with not only my own customers, but with you the reader. I believe this could be the beginning of a beautiful relationship. Congratulations on your blog. I’ll see you in January. Looks good! Happy Holidays….look forward to seeing you next year! Hi Susan – Dusty Deb McMurray here – you know me but maybe don’t recognize me by name? Anyway, I know you’re going to have to move soon and I’m wondering if you know yet where you’ll be moving to? I’d sure hate to lose track of where you are. Love to hear back form you. BTW – sweet photo of you on this page – love it.